Online retailer and now gadget-maker Amazon.com has announced a price drop on its popular Kindle electronic reader just in time for the holiday gift-giving season, plus taken the wraps off a new Kindle with U.S. & International Wireless that will enable owners to download books, newspapers, magazines, and other content in more than 100 countries and territories around the world. 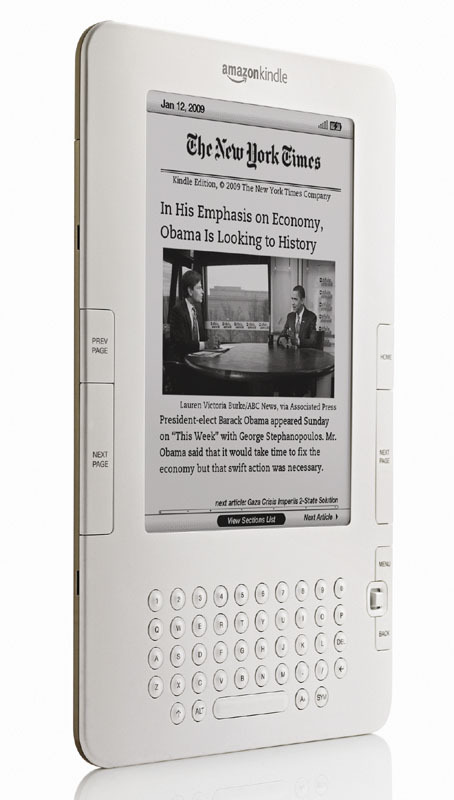 The price cut brings the basic Kindle reader more in line with competing offerings from other manufacturers, and the international downloading capability—which does not depend on Internet access—is an exclusive feature that raises the bar in the e-reader market. “Kindle is the most wished for, the most gifted, and the #1 bestselling product across the millions of items we sell on Amazon, and we’re excited to be able to lower the price,” said Amazon CEO Jeff Bezos, in a statement. The new Kindle with U.S. & International Wireless offers the same 6-inch E-Ink display and slim profile as the standard Kindle, and can tap into 3G wireless service in more than 100 countries so users will be able to keep up with their books, periodicals, blogs, and other content while traveling and without having to hunt for Wi-Fi hotspots. Using 3G service to connect back to Amazon means that customers will be able to get new content from countries like China and Indonesia which have 3G phone service, but where the Kindle isn’t actually available for sale. Like the basic Kindle edition, the new version with international wireless features 2 GB of onboard storage for books and other data, and can run for weeks on a single battery charge (with wireless turned off) so users don’t have to worry about staying near power sources. Amazon is taking pre-orders for the Kindle with U.S. & International Wireless now; it’s priced at $279 and will begin shipping to customers on October 19. The price drop on the basic Kindle unit to $259 represents a 13 percent price drop off the Amazon’s original $299 price tag, and brings the basic Kindle’s pricing more in line with readers from Sony and other companies. Amazon is still the leader in the e-reader market, although Sony—which was actually the first company to market an e-reader—has been making aggressive moves on Amazon’s business. The Kindle is also taking criticism for not supporting the Epub electronic book format: Epub books can be viewed on any reader that supports the format; however, the Kindle currently does not support Epub, and books purchased through Amazon cannot be used anything but the Kindle and Amazon’s Kindle applications for iPhone/iPod touch.